Stay tuned for upcoming events for Drama Golgapy Musical Night in near future. Drama Golgapy Musical Night. 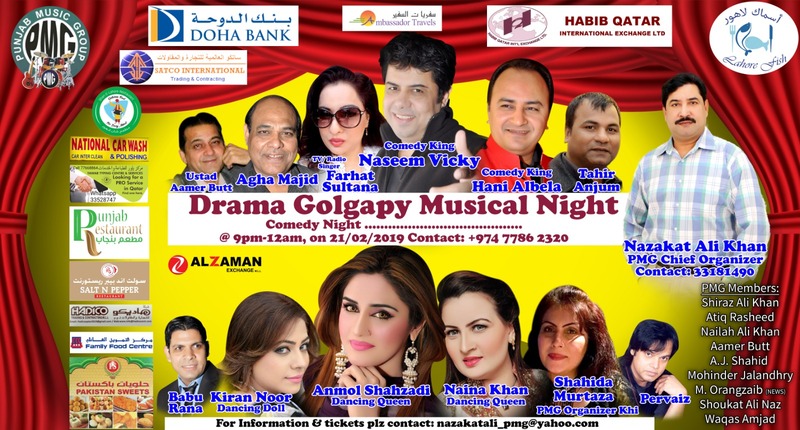 A Musical Night in Doha. Punjab Music Group is a famous event organizer in Doha. It has organized numerous music concerts and comedy shows in Qatar. Terms & Conditions : No refund or exchange or cancellation is possible once tickets purchased. Separate ticket will be required for children of age 2 or above. Best Viewed at 1024 x 768 pixels and above. This Page loaded in 0.08501 seconds on Wed, Apr 24, 2019 (21:04).